I met L.A. Reed at the previous game against the Iowa Barnstormers when I was getting the autograph of another injured player. I think he felt miffed that I didn’t have a card of him yet, as the only thing I had found was a photo of him going face first into the turf, so I was resolved to finding something more exciting and suitable. I must say this one really hit it out of the park. While I was wandering around the field, a woman in a walker beckoned me over to see him at the trainers’ table. He was extremely gracious and asked me what I wanted for the card. I told them the price was an autograph, and the rest that I gave him that evening were free. I understand that players are just as much as fans as we are. 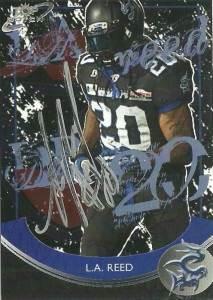 Their own football card, especially at the level of Arena football, is a way of a player actualizing one of those dreams they’ve always wanted. It is a way of saying that they have indeed arrived on a professional level. A four-year letterman for the Texas Tech Red Raiders, L.A. switched from wide receiver to safety as a Senior in 2008. He collected 19 tackles and 3 pass breakups that season, and is considered a blistering hitter and special teams demon. As a wide receiver, Reed had 39 receptions for 482 yards and 2 TDs. He was a surprising find for the San Antonio Talons in 2014 and really started laying down the wood before he was injured in Week 8 against the Barnstormers. I ran into LA hiding out in the crowd in the same section as me after the Talons loss to the Rattlers, with some of his rehab team. We talked briefly about basketball and the angst he was feeling as a LeBron fan being in a city full of Spurs fans. After discovering that I was a Spurs fan, he told me that he still liked me, – since I did such an awesome card of him.